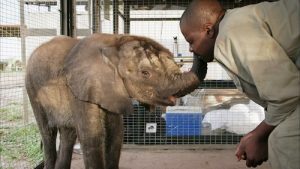 Kiti, a gentle elephant in Botswana, was in her 661st day of pregnancy, a normal gestation period, when she finally gave birth to a baby girl. 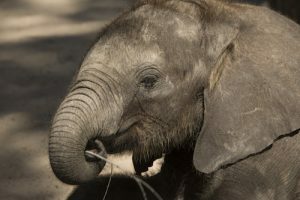 For nearly two weeks, the staff of Abu Camp, a halfway house for orphaned and former zoo and circus elephants, had been passing the time by coming up with a list of possible names for Kiti’s offspring. Perhaps because the calf was born at night, they called her Naledi, which means star in the local language. Naledi was an instant hit with the Abu Camp caretakers including elephant manager Wellington (“Wellie”) Jana who compared her arrival to getting a new daughter in the family. Wildlife biologist and Botswana native Dr. Mike Chase, who is also tasked with looking after Naledi’s herd, hopes she will have the option to be reunited with her extended family. That’s the aim of Abu Camp caretakers, to release capable animals back into the wild. Mike and Wellie are pleased with how Naledi is being accepted into the herd and the care she’s receiving from her mother Kiti. But six weeks after giving birth, Kiti dies from a prolapse of the large intestine, and Naledi is left an orphan. How the dedicated caretakers rallied to adopt the baby elephant, save her life, and reintroduce her to the herd that had forgotten her, is the focus of Naledi: One Little Elephant, A Nature Special Presentation airing Wednesday, January 30 at 8 p.m. on WOUB. Although elephant families are close, the program shows how precarious it is for a newborn to survive once it has lost its mother. Naledi needs to be nursed, so when the herd’s matriarch can’t produce enough milk and doesn’t know how to care for her, Mike, Wellie, and the other caretakers decide to take drastic measures before it is too late. The film follows the team as they separate Naledi from the herd, relocate her to another part of Abu Camp, make sure a caretaker is always with her around the clock, work to establish a bond, and finally entice her to take milk from a bottle. Crisis averted, the filmmakers are later on hand to document the cautious reintroduction of Naledi to her sisters and the rest of the family. She’s accepted by the herd, resumes her life in the bush, and the caretakers even celebrate her first birthday. But later, Naledi falls ill from eating palm fronds that have blocked her digestive track. The team agrees that surgery is the only solution, and the program chronicles her operation as the caretakers watch and hope for a positive outcome. Another storyline in the film is the gathering of data for the 2016 Great Elephant Census run by Dr. Mike Chase during his time away from work at Abu Camp. Its aim was to count every elephant in Africa to help ensure their long-term survival given that Mike estimates we’re losing 96 elephants a day and between 25,000 and 30,000 annually. Nature is a production of THIRTEEN PRODUCTIONS LLC for WNET and PBS. Executive Producer for Nature is Fred Kaufman. 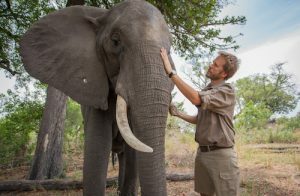 Naledi: One Little Elephant, A Nature Special Presentation is a Vulcan Productions film in association with Off the Fence. Executive Producers for Vulcan Productions are Carole Tomko, Paul G. Allen, and Jody Allen.